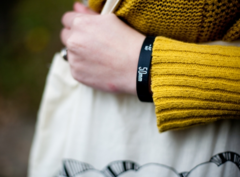 We love these new Lens bracelets by Photojojo, designed with the photo obsessive in mind. Made from soft silicone, the bracelet is a replica of your lens’ focusing ring. From the embossed “50mm” and AF/MF switch to the rubber grip ridges, we can’t think of a better addition to our camera style wardrobe. The bracelet comes in one size, in a choice of either 50mm prime or 24-70mm zoom.